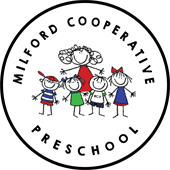 Welcome to Milford Cooperative Preschool! Please complete the following registration form. Tuition is paid in nine installments starting in September. Payments received after the 15th are late and subject to a $10 late fee. Tuition PAID IN FULL will recieve a 5% discount. Each tuition payment equals 1/10 of your child's annual tuition, which meets the yearly budget requirements. Thus, the school does not prorate for extended vacations or scheduled breaks. MCP accepts payments via ACH check or credit card through the Jackrabbit Parent Portal. We do not accept cash. MCP families may select the 1st or 15th of the month to process your ACH payment. All returned ACH payments are subjected to a $25 fee. Waiver and Release - I hereby understand and agree that I shall not, in any way, hold Milford Cooperative Preschool ("MCP") or any faculty members or board members (the "Released Parties") responsible for any injuries or accidents that may happen to myself or my child while attending MCP. I further agree to indemnify, and hold MCP and the Released Parties harmless, against all claims, damages, costs, and expenses (including attorney fees), brought by anyone related to mine or my child's attendance at MCP. A Supply Fee of $100 Per Child & Enrollment fee of $55 per child. I further understand that the enrollment fees are nonrefundable, and that May 2020 tuition is non-refundable if my child's spot is not filled by August 31, 2019, and that I will forfeit these fees if I withdraw my child from MCP. - I understand and agree that I shall be responsible for notifying 30 days in advance, the Director by way of enrollment change request form, if my child will no longer be attending the MCP. I understand and agree that as part of the MCP curriculum, MCP students and parents may go on field trips away from the MCP building and property ("Field Trips"), and that MCP may host third-party activities on the MCP building and property ("Activities"). I understand and agree that by signing the appropriate permission slip for the applicable Field Trip or Activity, I agree to hold MCP and the Released Parties harmless, against all claims, damages, costs, and expenses (including attorney fees), brought by anyone related to mine or my child's participation in any Field Trips or Activities. What is required of me as a parent? Membership Secretary, and are on a first come, first served basis. cleaning, gardening and parent/tot sibling watch. a safe/healthy location within the school. 2. Emergency services will be called if necessary. caregivers that were provided by family upon entering MCP. is remitted to parent/caregiver's care. difference in the lives of all the students that belong to MCP. * I will attend each and every General Membership Meeting. or pay a non-participation fee of $100 to the school. * I will pay tuition, building fees and fines on time. participation fee of $500/year. This option is subject to availability. present when I am scheduled for the day. maintain and improve the total growth and success of the preschool. with the staff to develop a plan to resolve the problem. I grant to MCP its representatives and employees the right to take photographs of my child and I, and my property, in connection with my child's attendance at MCP and participation in MCP student activities. I authorize MCP, its assigns and transferees to copyright, use and publish the same in print and/or electronically. I agree that MCP may use such photographs of my child and I with or without our names and for any lawful purpose, including, but not limited to, publicity, illustration, advertising and website content. I agree that I shall not bring any animals of any kind, including, but not limited to, dogs, to MCP under any circumstances without advance written approval of the MCP Board of Directors. I understand that MCP students could be harmed if I violate this Section, and I agree that I will be responsible for any injuries, animal or dog bites, accidents, claims, damages, costs and expenses of any kind arising from my violation of this Section. I further understand that if I violate this Section, my child may be expelled from MCP at the sole discretion of the Board of Directors. MCP has two Mandatory General Membership meetings each year. This Meeting provides all the information you will need for your family! It is a great time to meet the other cooperative families. One meeting is held in the fall and one meeting will be held in the spring.